My school has always administered exams in the first and third trimester (meaning that students usually are taking their trimester exam right about now). However, this year, we moved to a one exam model, which will be given at the end of trimester 2. As I thought about what I would do to shift things without an exam, I asked myself what part of the exam period I thought brought the most value to my students' learning. To me, the studying and synthesizing of material from the beginning of the school year, the organizing of information, and the focus on helping students make connections between the various units and topics is where the value lies. And so I decided to create a project for my students focused on these aspects. Metacognition – "thinking about one's thinking" – has been linked to improved learning outcomes. Research has shown that metacognition promotes deeper learning and affects whether students can transfer and apply their knowledge to new scenarios. Teachers can scaffold metacognition by asking students to explain their thought process. By asking, "how did you figure that out?" or "talk through your solution," teachers can help students reflect on the process and tease out the strategies they chose to use in solving problems. What's more, by providing opportunities for students to revise and analyze errors, teachers help students see more clearly how their thinking has improved and oftentimes allows them to see the solution differently. The final trimester project I created asked students to use Sutori to "document their growth & reflect on connections in AP Calculus." In the first trimester of AP Calculus, we have studied limits, derivatives, and begun applying properties of derivatives. This project allowed students to demonstrate their mastery of these sections by highlighting the connections they have been able to form between the "old" and "new" material. 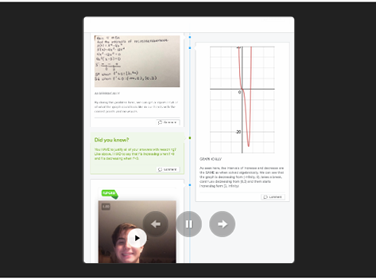 All trimester long, we have been doing reflective activities – through Flipgrid posts, homework revisions, and in creating self-made study guides. In this project, students pulled together work they completed in the past and wrote reflective statements talking about why they chose to showcase this specific question and how their understanding of the topic has grown.